How long it will take for settlement the case of LDC/UDC at Jabalpur CAT. How long the documents will be submitted to Jugegs of Jabalpur CAT. Wat happened to defending of MACP case? 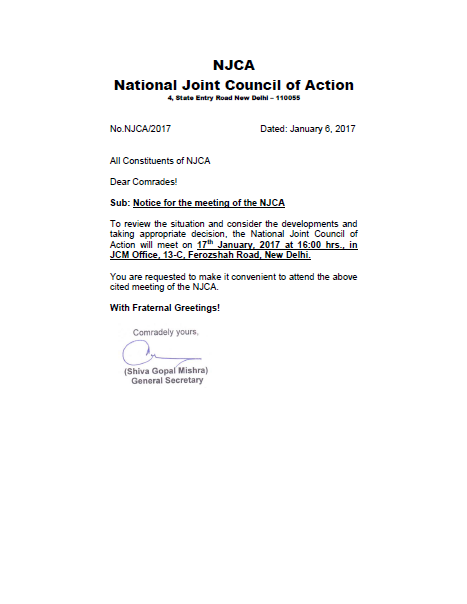 These unions, associations, confederations and National JCM(Staff Side) are useless. Their actions of postponing the strike, then Parliament March, on day strike on 15 Feb 2017 and further postponing to after Assembly elections. These union leaders are not fighting for employees cause. They are working on a fixed agend to take advantage so that it can be benifitted to them selves. Donot expect from these leaders. If you see the history of these unions from 2008(after implementation of 6th CPC) to till date, what their achievements. What happed to 6th CPC anonomolies. They forgotten every thing. These unions are in hand-in-glove with Govt. The need of the hour to replace National JCM(Staff side) or re-constitute with adding more cadre like EDP, Accounts, MTS etc. ��अपनी गलती ना हो लेकिन क्षमा याचना हेतु हाथ फैलाने हैं. फ़िर भी बात-बात पे नोटिस और पनिसमेन्ट ही पाने हैं. ��ड्यूटी अगर लेट हुयी तो अधिकारी चिल्लाते हैं. गलती चाहे किसी भी की भी हो सजा तो हम ही पाते हैं. Unions are not working for employees, they are working like agent of Government. Only declares meetings and next meetings like court declare Next date of hearing. Now the time to defend our self strongly by strike. It is once again requested to kindly discuss the issue of LDC/UDC in the next meeting and get result. I think that unions are agent who works for Govt as a consultants for them. Than to whom should we approach. That's showing you are not interested in the issue of LDC/UDC. This is now day by day going as useless blog. I am just wondered to realize how DOPT is behaving and controlling and monitoring the uniform implementation of HR policies and service condition Department wise. Day by day worsening. Shameful. Just Shameful. Before 6th cpc it was not soo prominent. But now even after accumulation of pending anomalies of 6th cpc along with currently generated 7th cpc anomalies, just servere coma. Obviously the elected National Government is answerable to the citizens of India and solely responsible for its decision making capacity in its tenure. They may have will to go for all round reformation. That is not also happening. What is happening is just an incident cant be expressed in words. Salary increase is not the factor. Atleast service conditions should be opportunistic. Otherwise no thing will be fruitful. Nothing!! You must remember that your blog has gained popularity by projecting the LDC UDC grade pay upgradation case. Now you are not paying heed to the requests of LDCs and UDCs. If you cannot do anything then stop giving false hope.